Games Created and Designed by Jody Boginski and Dana Duncan O'Kelly Illustrations by Virginijus Poshkus Four games in one! An educational treat created especially for ages 6 and up. The Rain Forest deck features 48 different animals in their natural habitat. 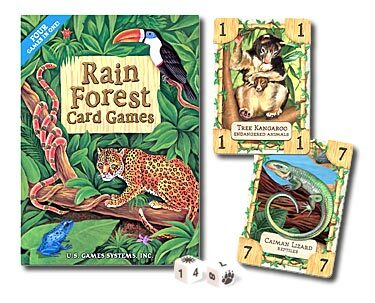 Includes two colorful dice with rain forest symbols (a leaf, a paw print, a sun, and a rain cloud) for the exciting game of "Jungle Rumble," two sheets of stickers and a colorful 18"x24" poster. Children also learn counting skills playing "Survival of the Fittest." Fun for the whole family!